Indicate if that game is fine, has minor bugs, or is completely unplayable, and describe why. Also, you can put here if the game doesn't run fast for you. Report: Plays excellent, have experienced no problems on any these devices with this game. Have played through a number of circuits and just perfect. Great to play. Not encountered any issues even when lots of action on screen and shells zooming around everywhere. Sound is also fine throughout. Report: Plays excellent too, no problems on these devices. Have played through a couple of Worlds. Report: Very playable, runs smooth throughout and not noticed any issues, all sound, cut scenes and gameplay perfect. Report: Runs perfectly, smooth throughout and not noticed any issues on the first level which I've played through, all sound, cut scenes and gameplay perfect. Report: Have only tested this on the HTC One at moment, will test on other devices soon. Frame speeds seem fine, though I do experience 'thin green horizontal lines' about a couple pixels width each on the main [upper] screen during play. Have tried adjusting settings but cannot get rid of these lines. They are somewhat obstructive to the gameplay, though can still see through/between them enough to play the levels. Report: Runs perfect in speed and function. Report: Runs perfect in speed. 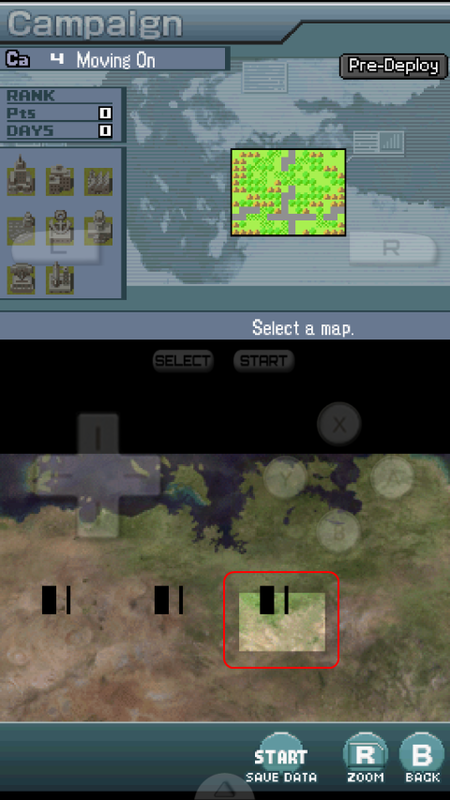 Graphical glitch on the bottom screen in the Campaign map select icons. Gameplay works fine, no problems yet!! and brings you back to the "Menü" homescreen where u can continue or load a rom. this problem didnt appeared YET while i was at normal emulation speed. 1 fatal error: Pixel error accurs instantly when going into a dungeon/tunnel - and if a wild pokemon appears while this pixel error is active- the game crashes instantly. Last edited by dahman on Fri Aug 09, 2013 7:38 am, edited 2 times in total. Status: Minor minor errors. Runs just fine, with little black dots or the ground every once and a while. Status: Minor and annoying bugs. The screens uhm, are flipped? You could easily fix this by allowing the portrait display to be flipped or possibly look into whats causing the screens to flip in the first place. Normal games this would be fine, but the two screens are used in tandem to make a large screen, making portrait view the best to play a game like this in. EDIT: fixed it by enabling the multicore thread 3D thingy. Last edited by BortzANATOR on Thu Aug 08, 2013 10:49 am, edited 1 time in total. Status: Not working. Crashes upon loading. Edit: After more testing works good. Havent tested everything yet. Status: Not working. Loads first time but after pressing new game black screen. after reloading white screen at startup. Edit: working but crashes after first few second in the intro movie. Can be played if skipping movie. Some visual graphics are missing like the kicks and fist from Aledy(main character) also when some people go in overdrive game crashes. Also with the eng patch doesn't get past the the fan made startup screen. Status: Not working. Black screen after loading the rom. edit: Starts up, laggs a lot. graphics mest up and buzzy sound. Same problems desmume had and the sound problem still exist in desmume and only goes away after special sound settings. Game: Dragonball Z: attack of the saiyans. Status: Working but without ap fix game freezes in battle or events, otherwise with ap fix evrything works. I do not know wy most games didn't even load in the first place but some are now more playable. Could someone try out Phoenix Wright: Justice for All. I use the first chapter video and court chapter as a benchmark. Would like to get some comparisons just before I test it out on my phone during the trial period. This is what I have tested so far. They all either run full speed without frameskip or fullspeed with a bit of frameskip. Scorchgid wrote: Could someone try out Phoenix Wright: Justice for All. I use the first chapter video and court chapter as a benchmark. Report: Starts, but heavy graphic&sound glitches in the begginig till the "choose your name" screen comes up. (Which displays pefect) but after you choosed your name, theres heavy graphic&sound glitch, unplayable for now. This section is going to get cluttered very fast, and this thread is going to be a pain for anyone to navigate to try to find if a ROM works on their phone. so members can log in and adjust entries. It could be as simple as 3 columns: Game/Device/notes. The device column could have 3 options of colors to depict if the game works, playable with bugs, unplayable. or something. Just a suggestion.